Silo offers a comprehensive set of interactive, context-sensitive tools for rapid polygonal modeling. The workflow is focused on having a few powerful, intelligent tools, rather than a separate command or option for every conceivable function. Additionally, “sticky key” functionality allows tools to behave differently if a hotkey is held down. Key modeling tools include Break, Tweak, Cut, Bevel, Slide, Scale, Extrude, Polygon Tool, Edge Tool, unlimited Undo and Redo, and more. Modeling can be performed with or without manipulators, including the Universal Manipulator which combines rotate, scale, and translate into a single manipulator. Robust selection tools are the key to great modeling, and a quick look at the Selection menu shows Silo’s development has focused heavily on this area. Some highlights? 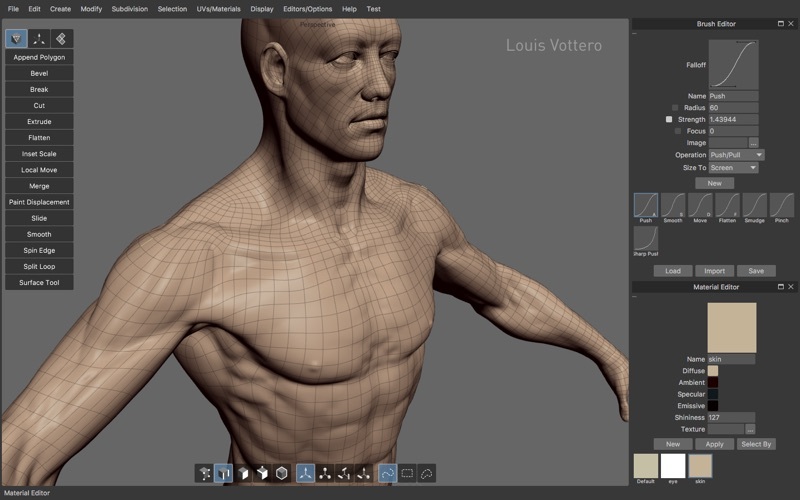 Multi Select mode allows users to select vertices, edges and faces without changing selection modes. Tweak selection allows a user to grab, move, and deselect a component with a single click. That and many other tools work with Soft Selection, which smoothly distributes changes throughout a shape. Paint, Area, and Lasso selection types are supported. Select Visible and Select Thru functions are both available – by default, use the left mouse button for Select Visible commands, and the middle mouse button for Select Thru. A separate Undo is available for cycling through recent selections. Designed to fit into any pipeline, Silo is the most customizable modeler available. That includes complete customization of the mouse, keyboard, and graphical interface, allowing it to closely emulate other applications a user may be familiar with, or perform tasks (such as assigning up to 40 different commands to a typical mouse with keyboard modifiers) which no other application can. Favorite tricks include assigning undo/redo, grow/shrink selection, and to the scrollwheel, or simply putting frequently used commands on the right mouse button with modifiers. Silo’s button pages allow users to create their own multi-page interfaces, and assign any command to any image. The interface and color scheme are also highly customizable. Customizations can be easily imported, exported, and shared. Even the Primitives menu can be customized with frequently used models or settings. Silo offers multiple types of unwrapping, including LSCM, Planar Region, XYZ, Per Face, and By Neighbors, which heals UVs based on the UVs based on the surrounding area. Different unwrapping methods can even be used on parts of the same mesh for optimal results. UVs are preserved during modeling operations, so modeling and UV editing can be freely interchanged with little to no cleanup. (This is particularly useful when a last-minute modeling change needs to be made to a “finished” model.) 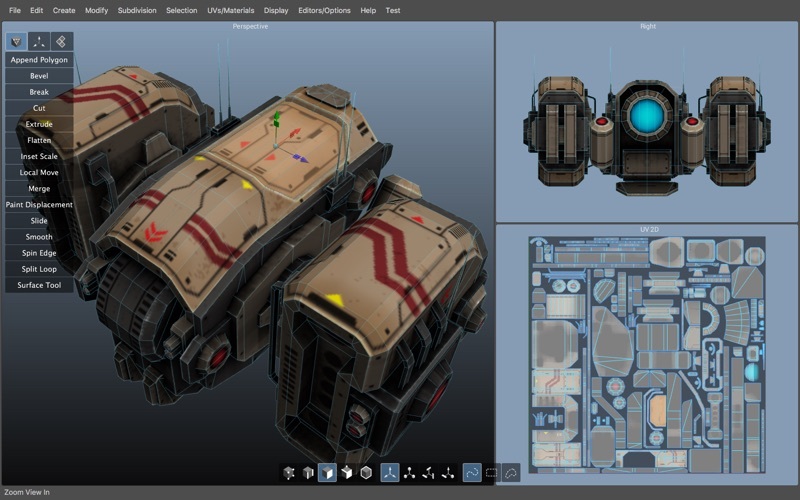 Clutter is significantly reduced by allowing regular geometry editing tools (such as Break, Merge, Tweak, Slide, and Soft Selection) to be used to edit UVs wherever it makes sense. Even the displacement brushes, particularly the Smooth brush, are very useful when applied to smoothing out UVs. Finally, brush-based displacement painting has been well-integrated into a traditional modeling environement. 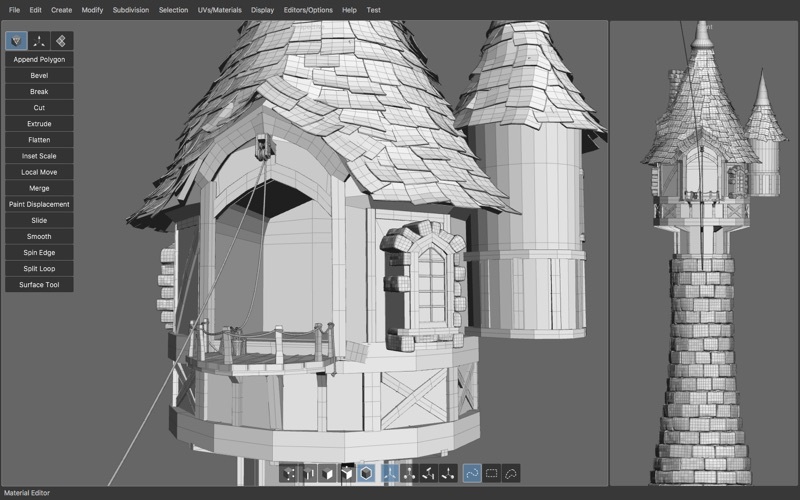 Silo’s brushes integrate seamlessly with the rest of the modeling toolset. If the model is subdivided, the brushes will affect the subdivided shape directly, otherwise they will affect regular geometry. As with UVs, displacement is preserved where possible during modeling changes, so the brushes can be used alongside other tools as the model develops, rather than solely at the end of the process. Painting is smooth and natural, and works well with tablets. Displacement maps and normal maps can be generated and exported from any subdivision level, or even from two completely separate objects. 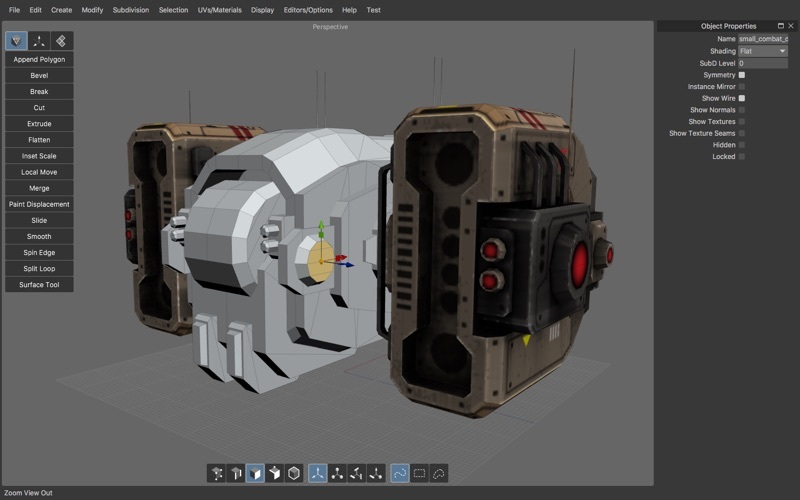 With the popularity of displacement painting in Silo and other applications, as well as the common usage of 3d scanners, modelers are frequently asked to create a new, well-formed model with a high-poly shape for reference. This process is frequently known as retopologization, and Silo’s Topology Tool provides an innovative solution by allowing users to directly draw new topology onto an object using a pen-like tool. Silo also offers Surface Snapping, which effectively turns every tool into a topology tool by snapping edited geometry to an underlying shape, and the Surface Tool, which allows users to quickly in interactively draw out and tweak strips of polygons.